China has successfully launched its sixth manned space mission, sending two taikonauts into orbit aboard the Shenzhou 11 spacecraft. The crewed vehicle was lifted atop a Long March 2F rocket at 7:30 a.m. local time on Oct. 17 (7:30 p.m. EDT / 23:30 GMT on Oct. 16) from Launch Area 4 at the Jiuquan Satellite Launch Centre in the Gobi Desert. Aspects of the mission have been kept under tight wraps, as the Chinese media had not revealed many details about the preparations for the launch. What was even more unusual, the officials had not announced the names of the individuals that would fly into space until a press conference which took place one day before the planned liftoff. 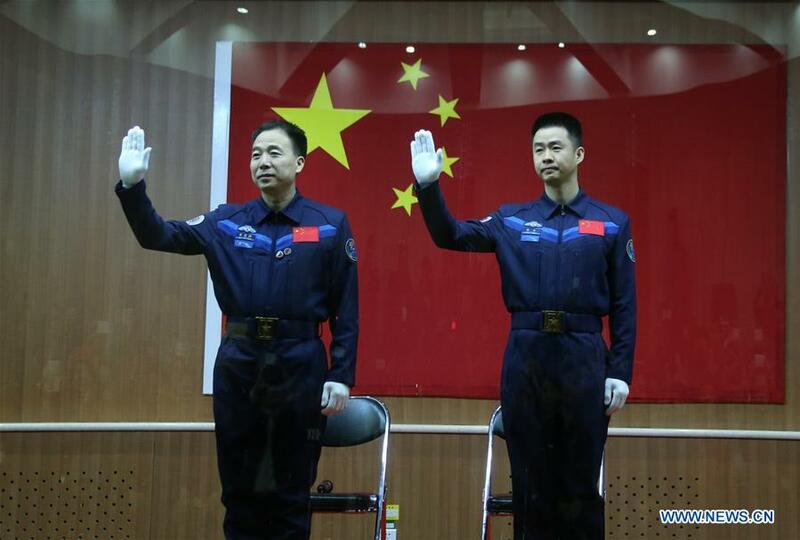 The two taikonauts, Jing Haipeng and Chen Dong, were presented at 9:00 a.m. local time (01:00 GMT) on Sunday, Oct. 16 (9:00 p.m. EDT Oct. 15), at the Jiuquan Satellite Launch Center; thus less than 24 hours before the launch. During the press conference, they answered several questions about the upcoming flight. Jing Haipeng is the commander of Shenzhou 11. This is his third spaceflight as he has already flown into orbit twice: in September 2008 aboard the Shenzhou 7, and in June 2012, serving as the commander of the Shenzhou 9 mission. Chen Dong will fly into space for the first time. He was selected as a taikonaut in 2010. “Although the job is challenging, risky and dangerous, there is nothing more I would rather do,” the 50-year-old Haipeng told reporters. Dong, who is 13 years younger than his crewmate, added that he will treasure every moment in space and ensure he will record his experience in his diary as well as enjoying “the out-of-this-world scenery”. Haipeng and Dong arrived at the launch pad some two-and-a-half hours before liftoff in order to enter the Shenzhou 11 spacecraft. The Long March 2F rocket with the spacecraft on its top was revealed standing tall on the launch pad about 45 minutes before liftoff when the service platforms were moved away. Fifteen minutes before liftoff, the Launch Abort System was activated, which was followed by turning on the spacecraft’s internal power system. Last checks of all the systems were performed approximately four minutes prior to the ignition of the rocket’s engines. Thundering from the launch pad, the Long March 2F rocket commenced its short vertical ascent before pitching and rolling into a southeasterly direction, heading toward over the Yellow Sea. About two minutes after liftoff, the Launch Escape Tower was jettisoned, some seven seconds before the burnout of the rocket’s four boosters. The quartet of boosters, consisting of one YF-20B engine each, separated about two minutes and 35 seconds into the flight. Then the rocket’s core stage, fitted with a cluster of four YF-20B engines, detached from the second stage some five seconds later. Afterward, the second stage took control over the flight, being powered by a YF-24B engine. About 50 seconds later, the protective payload fairing was jettisoned, revealing the manned Shenzhou 11 capsule. This phase of the mission lasted approximately five minutes until the second stage burned out. The Shenzhou 11 spacecraft separated from the second stage at nine minutes and 45 seconds into the flight. It unfolded its two power-generating solar arrays almost immediately to begin its two-day trek, ending with docking to the Tiangong 2 orbital laboratory. The secretive mission campaign commenced on Aug. 3 with the arrival of the Long March 2F rocket at Jiuquan. The launch vehicle was delivered from Beijing by train, while the Shenzhou 11 spacecraft was transported on Aug. 13 from China’s capital city to the space center by airplane. Chinese media had not disclosed any details regarding pre-launch preparations. It was only revealed that the rollout of the rocket, from the assembly facility to the launch site, was carried out on Oct. 10. The start of the mission was postponed several times as its launch was dependent on Tiangong 2, which suffered a series of delays. The first rumors about a more precise launch date appeared in November 2013 targeting May 2016 for liftoff. Shenzhou 11’s primary goal is to dock with Tiangong 2. The taikonaut duo will enter the laboratory and stay inside for 30 days, testing advanced life support systems and conducting various science experiments. It is expected to be China’s longest stay in space to date. The two-person crew will probably return to Earth on Nov. 14. “To meet the needs of this mission, the orbit control strategy and flight procedures have been adjusted to adapt Shenzhou 11 to the change of the rendezvous, docking and return orbit from 343 kilometers (213 miles) to 393 kilometers (244 miles) from Earth,” China Daily reports. In order to enable a month-long stay in space, China decided to downsize the crew from three to two. Previous missions, such as Shenzhou 9 and Shenzhou 10, consisted of three taikonauts orbiting the Earth for two weeks. “[For this mission] we have improved our ability to deal with emergencies, first aid and space experiments,” Haipeng said. China hopes that Shenzhou 11, together with Tiangong 2, will bring the nation closer toward building its own permanent space station. They will enable testing of key technologies before sending a larger module into orbit. That station is expected to be built sometime between 2018 and 2022. “With the establishment of its own space station, which is expected around 2020, China will carry out manned space missions on a regular basis, with spacecraft launched several times a year, instead of once every several years,” said Zhang Yulin, deputy commander-in-chief of China’s manned space program. The Shenzhou 5 mission, launched in October 2003, was China’s first crewed spaceflight. The spacecraft sent Yang Liwei into orbit for about 21 hours, making him the first Chinese national to fly into space. From 2011 to 2013, the country conducted three Shenzhou missions, one every year. Shenzhou 8 was launched in October 2011. It was an automated test of rendezvous and docking with Tiangong 1, China’s first space laboratory, which was delivered into space one month earlier. Shenzhou 9 and Shenzhou 10 both carried three-person crews, and both docked to the Tiangong 1 lab. Shenzhou 9 and Shenzhou 10 were launched in July 2012 and June 2013, respectively. “Since the very beginning, China has understood that innovation was the only path to success. Within the past 60 years, China has mastered a number of core technologies with completely independent intellectual property rights. China’s space program is now accelerating, but it has left its military roots behind. The future is science and exploration,” the state-run Xinhua press agency comments. The 170-foot (52-meter) tall Long March 2F rocket, which was used to launch Shenzhou 11 into space, is 11 feet (3.35 meters) in diameter and weighs around 464 metric tons. It is a two-stage rocket capable of sending up to 8.4 metric tons into a low-Earth orbit (LEO). For this mission, the rocket flies in 2F/G configuration that was specially designed to launch spacecraft such as Shenzhou and Tiangong. It features a launch escape system and has a larger fairing to accommodate larger payloads. Monday’s launch was the 237th flight of the Long March rocket and the 15th orbital mission conducted by China this year. The next Chinese missions are currently scheduled for November. The country plans to conduct a maiden flight of its Long March 5 booster before conducting one launch of its Long March 2D rocket, carrying the country’s Hard X-ray Modulation Telescope. However, China has launched many missions unannounced. An unexpected liftoff could be carried out in October.